Boursin, people. Boursin cheese. Rich, creamy and speckled with herbs. 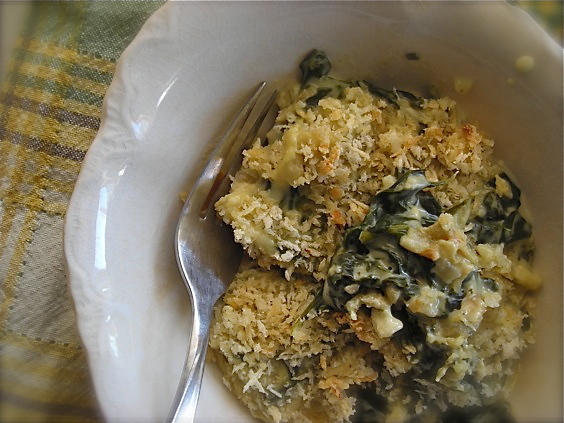 Melted and mixed with fresh spinach, topped with crunchy bread crumbs and baked to perfection. Ultra-satisfying and delicious. But strangely, I took a bite and swore I’d had it before, sometime far and long ago though. I know it wasn’t recently, and I’m pretty sure I was quite young, but the flavor of this was familiar in that misty, distant fashion that reeks of deja vu. On my birthday in early March, we dined at a restaurant where perfectly cooked rotisserie meats were the star, and along with the meltingly tender chunks of meat that graced our plates, Mike and I selected a side of creamed spinach that was equally blissful. The spinach was tender, perfectly cooked and in a delicious bath of smooth, lightly seasoned sauce. I remember sighing sadly as the last bite was scraped from the dish, and it was so blissful and perfect that I dreamed about it for days afterwards. Who dreams of creamed spinach? Especially since it was the first time in my life that I’ve eaten it. Yes. First time. I fell hard I guess. I’d seen numerous recipes for it, chock full of decadent heavy cream that made my arteries cringe away in fright. Not that Boursin cheese is any different; folks, this dish is rich like an oil baron. But given the richness of the added Boursin, I knew I wouldn’t need heavy cream to make it. In fact, I think having heavy cream, which the original recipe calls for, would make this dish a bit too much. As it is I could only manage a few mouthfuls, complete with much eye-rolling, and heavily satisfactory sighs. Heavy cream AND Boursin? Sometimes, you can have too much of a good thing. Of course, any dish where there is delightful browned, butter drenched panko crumbs gets an enthusiastic thumbs-up from this girl. I find myself making up excuses to brown myself a pan of them, fluttering them through my fingers to grace the top of just about anything, then gleefully slurping the rest from my hand. Something about their delicate crispness just makes my mouth happier. With this spinach, they form a nice crust on top of the gratin as it bakes, adding a polar opposite element to the smooth creamy base and lovely al dente spinach. While this isn’t exactly the lightest of Spring fare, and I certainly wouldn’t want to drench the upcoming fresh spinach crop under such a disguise, I am glad to know that for a cool night I have an option to set my mind dreaming once again. And maybe more importantly, keep it there for good. Does the idea of Boursin cheese make you swoon too? Tell me how you love to eat it, and to offer you another decadent side dish, please check out Chris’ Ultimate Boursin Mashed Potatoes. In a medium oven proof skillet with a cover, melt butter and add shallot, cooking and stirring until soft, about 5 minutes. Stir in flour to coat and then slowly begin whisking in milk until fully incorporated. Stirring constantly, bring sauce to a gentle simmer to thicken, then add in Boursin cheese, a small amount at a time, until all of it is blended into the sauce. Drop a handful of spinach leaves into sauce and stir to coat. Add more, a handful at a time, until all spinach is mixed well with the sauce. Bring to a simmer, cover and simmer for about 5 minutes. Mix panko, salt and pepper and melted butter, sprinkle over top of spinach and place pan, uncovered, into oven. Bake for 10 minutes, until bubbly and crumbs are browned. Remove from oven, allow to cool slightly (remember that pan handle is HOT!) and serve immediately, sprinkled with parmesan cheese. Alternately, mixture can be divided among smaller ovenproof ramekins to be baked. 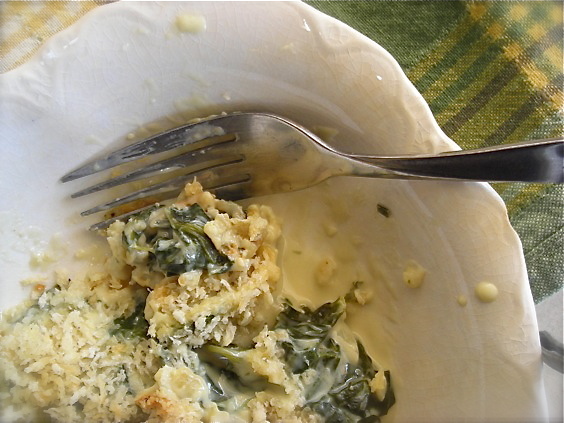 Divide spinach into ramekins before topping with bread crumbs. Baking time will be shorter. 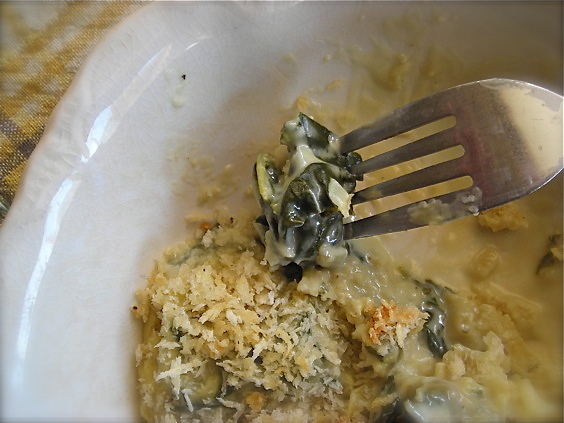 Just posted the Boursin Spinach Gratin. I hope that I did it juctice. I love the recipe. It is fantastic. I got to this article from Facebook (one of my friends posted it). After checking your article, I clicked “Like” and shared it. More power. That is my kind of dish! We just had this for dinner. It was amazing. I posted it on Twitpic and gave you credit. I will link to your site when I blog about it. Thanks for such a great recipe. This is a keeper!! Oh that looks so creamy and delicious! Love, LOVE, Love the new look, Kate!!! 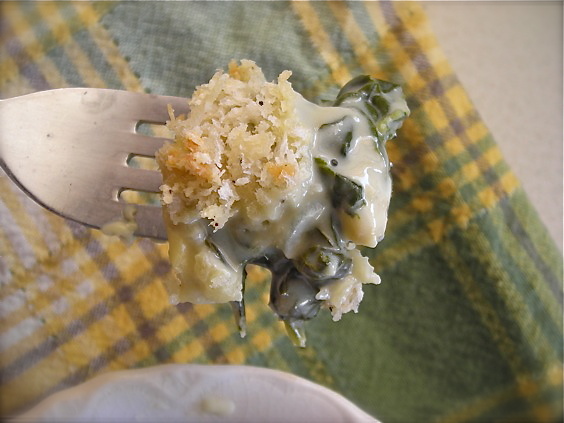 Happy belated birthday and thank you for posting this inspiring Boursin Spinach Gratin. oooh la la!!! It looks delicious!!! GAH! Guess what, Sam’s was out of Boursin today 🙁 You rock because Alexis and I discussed the possibility of making “spinach maria” with Boursin when we were making the mashed potatoes. I can’t wait to try this. Love the new place, looks great. 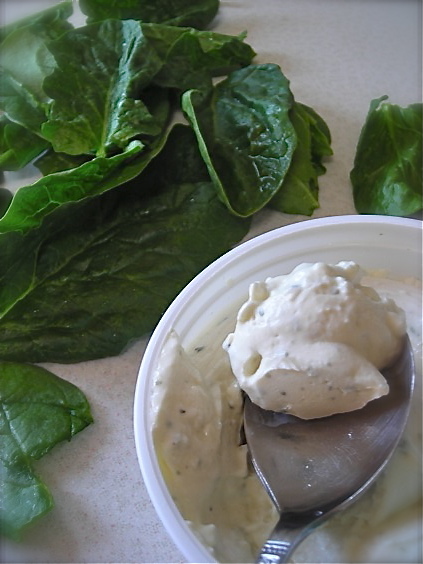 I am CRAZY about Boursin… have a recipe that I make and it tastes even better because the herbs are fresh. Love it. And a spinach gratin with boursin can only be a knock out dish. What a great idea! Thanks! Schmancy new blog digs, Kate! You’re killin’ me Kate. We’ve be eating boursin for about the last three weeks straight, now I’m gonna have to make this! I have a beautiful bag of spinach from my CSA in my refrigerator waiting to be cooked. I am using this recipe! Kate – I love your site redesign. You’ve certainly mastered food photography, which is certainly challenging! This recipe looks fantastic. I’ve already shared it with Ef! I’ll have to figure out how to make it GF for myself… but, I’m looking forward to giving it a try – I love spinach!